Definition: A digraph $D$ is Eulerian if it contains a closed trail (a walk containing no repeated arcs) that contains all of the arcs in $D$. This closed trail is known as an Eulerian Trail. This is because we must start our trail at vertex $a$ and end at vertex $a$. This is of course, impossible, since the in-degree of vertex $a$ is $0$. 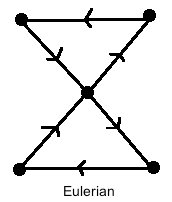 Theorem 1: A connected digraph is Eulerian if and only if the in-degree of each vertex equals the out-degree of each vertex. 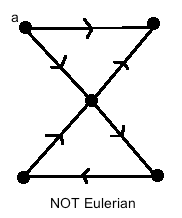 We will not prove this theorem, however we should note that if the in-degree does not equal the out-degree, then at some point in our Eulerian trail we will either be "stuck" at a vertex, as in there will be no more available arcs to traverse that haven't already been traversed OR "trapped" at a vertex.